This expert water heater consumer report helps you choose the best storage water heater, including the right size, gas or electric, and cost considerations. 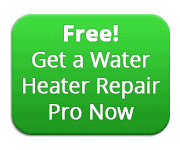 Choose a water heater that has the right energy efficiency, fuel, and capacity for your home. Storage water heaters are the familiar tall, cylindrical white tanks that utilize natural gas, electricity, propane, or fuel oil to heat water. They store from 20 to 120 gallons of water, depending on the size of the tank. For a closer look and comparison of other types of water heaters you may want to consider, please see Hot Water Heaters. 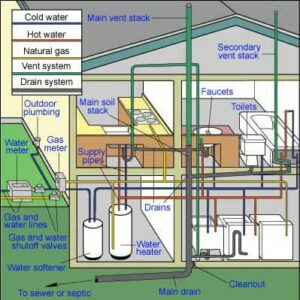 Even within the category of storage water heaters, your choices are many. In determining the right water heater for your home, you should consider some specific concerns, such as how big it should be, where it will go, and whether it will need to have a vent. You’ll also need to decide whether you’ll buy a water heater that uses natural gas, propane, electricity, or a less common fuel such as wood or wood pellets. This buying guide will help you sort through your many options. Energy efficiency should be a big concern. On average, storage water heaters last from 8 to 10 years, so one that operates efficiently can pay you back in energy savings over time. 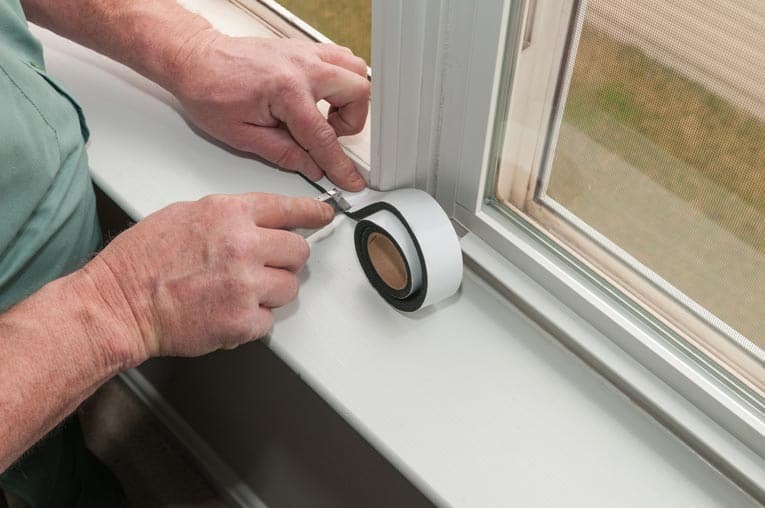 Check the yellow EnergyGuide label, your best tool for comparing models. Energy.gov offers an energy cost calculator for gas and electric water heaters online. 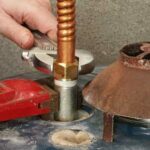 Water heaters affected include gas-fired, oil-fired, electric, tabletop, and instantaneous gas- and electric-fired. If you’re thinking about buying a new water heater, you may be wondering whether you should get one that is gas-fueled or electric. 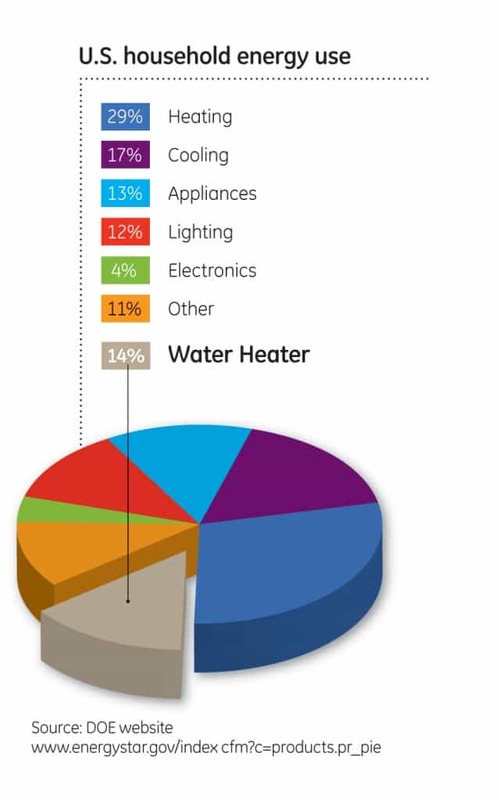 Natural gas fuels more than half of all water heaters; electricity heats most of the remainder. A small percentage of water heaters burn propane (LP), oil, or kerosene. And some use wood heat or solar collectors to heat water. If natural gas is available, your next water heater should be gas-fueled. Electricity is the fuel of choice only where it is the only option—or where it is impossible to run a flue out the roof to carry the water heater’s combustion emissions. Gas is both cheaper and much faster at heating a tankful of water. So are propane, kerosene, and oil, but they’re less convenient because they must be delivered (not piped) to a house. Obviously, these amounts vary with local energy prices and change over time, but in the relative world of energy, natural gas is by far the cheapest, most convenient fuel. The fuel your water heater uses will affect both the annual cost of heating water and the water heater’s efficiency (how well it converts the energy into heated water). Some water heaters use fuel more efficiently than others. 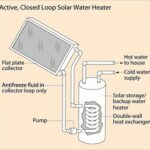 An electric heat pump water heater, for example, typically is more efficient than a conventional storage water heater and, as a result, might have lower annual energy costs than a natural gas water heater because of its high efficiency. On the label, check the energy factor (EF). This indicates how well the unit converts its fuel to heat. The higher the EF number, the more efficiently the water heater uses its energy. Electric water heaters have EF numbers between 0.75 and 0.95, and gas units are rated between 0.5 and 0.7. Although electric units may use their fuel more efficiently, in most regions electricity is much more expensive than gas. Another label on the water heater should reveal its first-hour rating (FHR) number—this indicates how much hot water the heater can supply per hour at peak usage. The minimum FHR to select for your home will depend on the number of bathrooms and residents it has. The FHR (First Hour Rating) indicates how much water can be heated per hour. 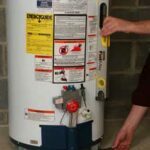 Though the term “capacity” refers to a tank’s size, the real capacity of a water heater is a result of two factors: storage and recovery time (how quickly it can heat a tankful of water). 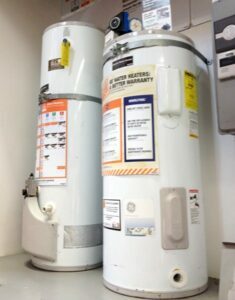 Storage water heaters range in tank size from 20 to 120 gallons; the most common sizes are 40 to 80 gallons. (Short “low-boy” models are available in smaller sizes.) It’s important to match size to your family’s needs. If you get a tank that’s too small, you’ll frequently find the water cooling down just about the time you lather up in the shower. On the other hand, if you buy one that’s too large, you’ll be paying more than necessary to keep the tank heated. The right size of water heater will depend on the number of bathrooms and water-using appliances in the house and your family’s needs. Needs can be measured by the number of bathrooms in the house, though some circumstances can skew these standards—a laundry-heavy family with small children, the overall number of residents in the house, or a house with an especially large bathtub, for example. Obviously, just a couple living in a large house or a large family living in a small house require adjusting the size of the water heater required. The minimum-size unit for a one-bathroom house should be 30 or 40 gallons, in either a gas or electric model. For a one-and-a-half-bath house, 40 gallons is minimum. For a two- to three-and-a-half-bath house, choose a 50-gallon gas heater or a 66- to 80-gallon electric one (because electric water heaters take longer to heat water, large tanks should be bigger than their gas-fired counterparts). For a large, four-bath house or a home with an extra-large bathtub, get a 75-gallon gas heater or a 120-gallon electric heater. Recovery of gas-fired water heaters is a function of the BTU input and overall efficiency. Input ranges from about 32,000 on a 30-gallon unit to 88,000 on a 100-gallon tank. A common input is 34,000 BTUs on a 40-gallon tank and 36,000 BTUs on a 50-gallon tank. The higher the BTU input and efficiency, the faster the recovery. Electric water heaters typically have one 5,500-watt or two 4,500-watt elements. Two lower-kilowatt elements will heat much faster than one higher-wattage element. Both gas and electric storage water heaters are rated by the number of gallons they can raise to 90 degrees Fahrenheit in one hour. Most electric heaters are rated from 20 to 25 gallons per hour; many gas units can recover more than a full tank. A high-recovery 50-gallon Rheem gas model can recover up to 81 gallons per hour. When buying a high-BTU gas model, be aware that it may require a 4-inch flue rather than the standard 3-inch flue that probably currently exists in your house.